Kassidy Gorman dribbles the ball. The rising senior defender and the Wildcats played a friendly against the Mexican U-20 national team on Tuesday. For Northwestern, accustomed to the comforts of Big Ten soccer, Tuesday’s matchup against Mexico’s under-20 national team was something new. “They were a great team — very fast, very quick and very creative on the ball,” rising junior midfielder Marisa Viggiano said. 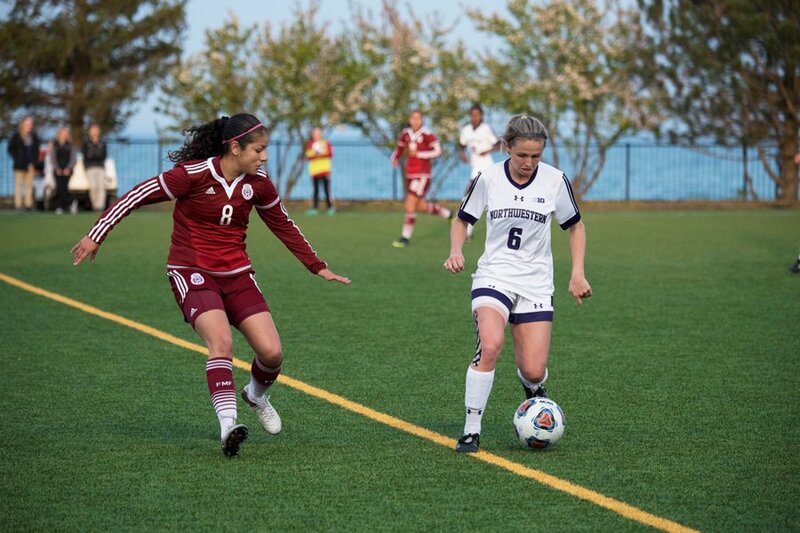 The opponent was different, but the Wildcats’ showing in the spring friendly was familiar. In a 2-1 defeat against its international foes, NU demonstrated solidity and good shape in the back for much of the game, but an inability to find a final ball or composed finish in the run of play was the Cats’ undoing. Ultimately, two Mexican goals in the first 20 minutes proved to be too much for NU to overcome. The Cats rotated in a number of players up front, looking for options that could provide a spark. Though several players put in good shifts, NU lacked the killer instinct around the goal to finish the chances it created, as it did for much of last season. While the Cats’ attacking corps is thin, their defensive foundation remains sturdy, with the entirety of NU’s first-choice back four returning next season. Still, Moynihan chose to experiment with his defense early on, trotting out a back three and making changes from last year’s regular lineup. That look didn’t do much to slow the Mexican attack. Mexico captain Belen Cruz notched a 13th-minute goal, and Jacqueline Ovalle doubled the lead in the 20th by blasting a shot into the top corner of the net from the opposite corner of the box. The strike brought a vocal Mexican contingent to its feet, and its chanting and cheering continued throughout the evening with its team largely in control of proceedings. The Mexican squad had the edge in possession and skill, but NU’s size and strength on set pieces was enough to get the Cats back in the game. Rising junior defender Kayla Sharples hammered home a towering header off a 28th-minute corner kick to halve the lead, and NU’s best chances to equalize in the second half were off corners, including one that forced a Mexican defender into a goal-line clearance in stoppage time. NU shifted back to a back four as the game wore on and didn’t yield another chance of note, but was unable to overcome Mexico’s talent advantage. In its second game of a three-match exhibition tour against Midwestern college teams, the international opponent was better on the ball and kept the Cats in their own end for much of the game. Months from matches that matter, Mexico proved a good test for NU as it looks to surpass a historic 2016 that saw the team win a piece of its first-ever Big Ten regular season title.